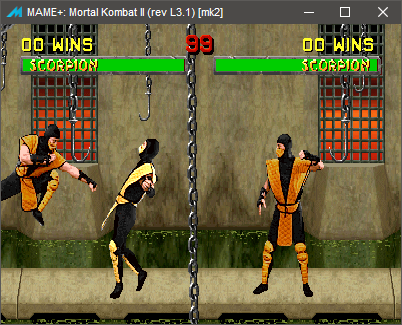 Mortal Kombat II+ (Beta 2) Released! Team Plus had a great weekend at the 2019 Cincinnati Kombat Klassic! It was a great turn out and the competition was outstanding! Work has finally been rolling nicely on the next release from the Plus Team, it will be the first beta of Ultimate Mortal Kombat 3! Plenty of fixes, additions and new features will be koming your way with this great game! Check out the YouTube channel to watch live streams of the work! A slight delay on the beta 2 release due to a last minute 2v2 bug that needs fixed. Shouldn't take long, maybe a day or two to fix it and another for proper testing. My apologies to all those eagerly waiting to play it. Hang it there, we're so close! Slowly adding more kontent to this website, the 'Overview' section will continue to grow until I get it finished. Updates are rolling along at a steady pace, a minor but long standing bug in MK2 has been addressed this morning. This is the alternate palette not being utilized when Scorpion performs his teleport move. As you can see below that is now fixed. Public Beta #2 status: I know everyone's waiting so patiently for the 2nd beta to drop, but due to a few BIG secret additions a week ago it will be a slight delay. Trust me, you guys will appreciate the extras that I've added. I can't comment on what they are because they're hidden. So don't worry, I'm working vigilantly on getting it ready! Plans are to release a new beta soon! I'd hate to drag out testing, but with the inclusion of some great additions like 2v2 and more great features it's a good thing to do. I just can't stop adding more to this great game! Sorry for the delay! As you can see Team Plus was a little busy at KombatKon 2017! Kung Lao and the Scorpions at the after party! The time has come that everyone has been waiting for! Head over to the downloads section and get yourself version 2.8 Public Beta! galera como inslata essa patche? I love to play Mortal Kombat II Plus. Please make a Mortal Kombat 1 Plus. You could add an option in the dipswitch menu (F2) as well if you want like mk2+settings > enable player's name (on/off). Please consider this, It would be awesome if you add this feature to this great project. Also assuming you're not masking the checksum, that's why I'm getting "bad rom" errors on UG12 and UJ12. Let me know if I shouldn't be getting bad rom errors. Game's up and running and PLUS options are there. Pretty awesome! Can't wait till next update! Correct, valid checksums will be available on final releases.